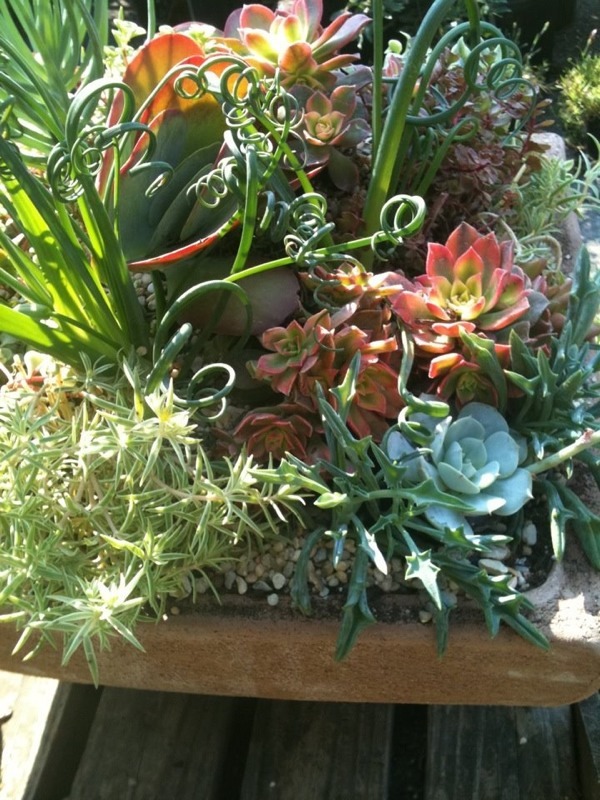 This planter shows what we did with some of the succulents we’re beginning to get in – this definitely means spring is coming! 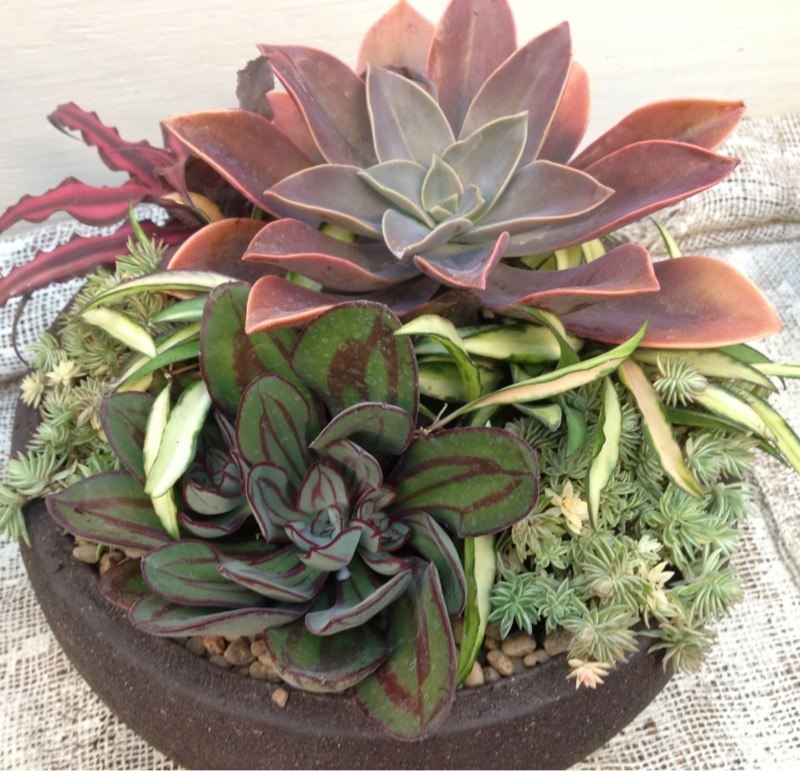 Echevarias, rhipsalis, sedums, cryptanthus, these are all plants that take our summer heat in stride. Some are annuals and only grow through the summer, while others will survive winters for us as well. Mix them with a few herbs – think thyme, oregano, chives, sage, trailing rosemary (we’ll give you examples down the road!) or other sun lovers – a pretty variagated yucca would be interesting, or you could go with a different contrast in leaf form and soften the look with some asparagus fern…the possibilities are endless and so much fun! 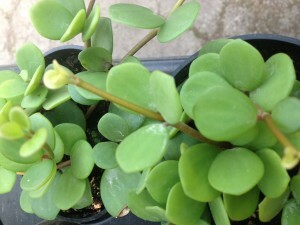 You could even include some houseplants – pepperomias in particular work well as do some pileas. 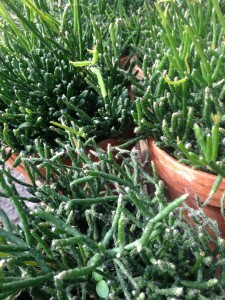 An interesting plant you may not have seen much of is one called rhipsalis, with light, thread-like foliage. Remember, these will add a lot of color all by themselves. If you would like some flowers in the mix, purslane, narrow leaf zinnias (cut them back if they try to take over), and mecardonia (tiny yellow flowers on a low growing, trailing plant) are a few you could start with. 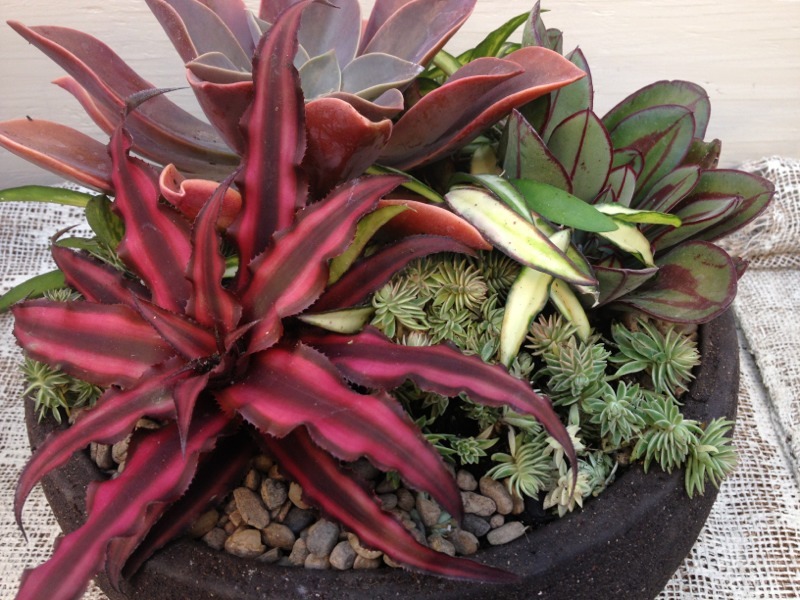 This entry was posted in Annuals, Herbs, Spring, Succulents, Summer and tagged cryptanthus, echevaria, oreganos, sage, sedum, spring, thyme, trailing rosemary on March 5, 2013 by Kris Blevons.